I'm not sure where I got this but wish I'd adopted it about 50 years ago. In addition to professional musician Gabe who has entertained us, professional photographer Dave is also at the campground, has been coaching me a little, and inspired me to get away from the auto settings on the camera. Here are a few taken around the campsite (shot on manual) with the second one being about the way it looked to my eye light wise and the third one with a little warmth added to the second shot to get the color right. They had lived in the area at one point and knew the places to go so we were more than willing just to be where they told us to be. The Food Shack is located in a strip mall and would be very easy to ignore from the outside. When we travel, we enjoy visiting and shopping at farmers markets and while the pickins are scarce where we are staying, there are several within an hour’s drive on the Atlantic coast. Our first one was the Palm Beach Gardens Green Market which seems to be put on by the city and is held in a parking lot beside the municipal building. With more than 120 vendors, it is a very big market with my two photos showing only about ¼ of it. It is a collection of arts & crafts, produce, prepared foods, bakeries, plants, seafood, cheese, and food & drink vendors and they were all intermingled so you had to walk the entire market to find all of the produce, for example. I didn’t take many specific shots but this quiche looked too good to walk by. As you can see from above, it was very well attended and a parking space was hard to come by – I’ve never seen so many clean cars in my life and being where we were the high dollar models were pretty common. We ended up buying a little produce, some baked goods, two quarts of bisque, made from Maine lobster, and a quart of spicy sour pickles – hard for me to believe no jewelry was purchased. If in the area and you like farmers markets/ craft fairs you will probably want this one on your must see list. From the market, we headed over to the beach and drove Ocean Drive north to Jupiter before heading back to the campground. We all commented at never seeing the Atlantic look prettier. Some of the best times I’ve had were the result of an impromptu event and this was no exception. Our camping neighbor, Gabe, had mentioned that he had been a performing musician during his life and when some old friends of his unexpectedly showed up in the campground, they decided some music around a campfire was in order. About 30 minutes later we were gathered round the fire, where some roasted weenies, others just sipped a beer, some bundled up under a blanket – it was a little cool - and we all enjoyed the sunset over Lake Okeechobee. For at least three hours, Gabe played and sang classic country using his guitar signed by The Hag. We had such a good time and only wish more campers had joined us. While it's been cool here, the house sitter reports it's downright cold at home. As I have gone through life, three things I’ve learned – be honest with myself about who I am down deep, love myself for who I am, realize that others opinions of me are just that and only I know the real me, only then I will be comfortable enough to allow others to see the me that I see. While picking up supplies at the market, we discovered a 2 for 1 deal on chuck roast and I knew I had just the recipe, so into the cart they went. As we are fans of balsamic vinegar (especially Bev) I had recently saved Penny’s recipe for Crock Pot Balsamic Shredded Beef from her Lake Lure Cottage Kitchen blog. Since I followed her recipe, rather re-print it here, please head over to her blog for the recipe and some delicious shots. As I've mentioned, I like to camp and do as much as possible outside using the Coleman propane and Weber Jumbo Joe charcoal grills. Since I discovered the Coleman is a real pain to clean after grilling, I now use it as a stove and grill on the Weber. Since we have only a 4 qt. crock pot, I had to cut the meat into pieces and used the opportunity to remove some of the major fat. Then, after browning in a skillet, I stood the pieces of meat on edge to fit into the crock pot and poured the sauce over it. After cooking, I removed the meat from the pot along with half the broth and after shredding the meat, I added back just enough broth to provide the moistness I was looking for. We just boiled some potatoes, mashed them on our plate (remember, we're RVing) and topped them with the meat. It was delicious and a fine alternative to the normal roast beef flavor - thanks Penny. It made an outstanding sandwich as well. Before we decided to spend a month near Okeechobee, FL we were warned by our friends that there is not much there and during the tour they gave us of town, they said it was just one big fish camp. we decided it was time to make the roughly 100 mile journey around the lake to see the sites. We began at our campground and headed south on US-441which is a much busier road (especially semis) than I would have expected considering the location. I guess it may be a good route between the West Palm and the Tampa areas. There seem to be three main industries in the area - farming, ranching, and fishing based tourism. 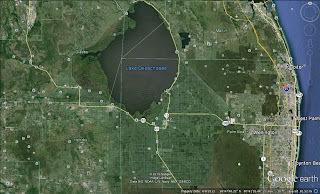 Lake Okeechobee claims to be the best lake in the country for crappie and one of the best for bass. In general the bottom side of the lake seems to be farming while the upper end is ranching. This is a Google Earth shot of the lower part. Here are some shots of some of the richest looking farmland I’ve seen and the crops of corn and sugar cane. The smoke in the middle shot is from a cane field that is being burned to remove the greenery prior to harvesting the stalks to make sugar. These are some shots of the Port Mayaca dam & lock and the lake from the rim (dike) near it - most of the rim has either a trail or road atop it. We were hoping to see the Mantees that had been spotted in the canal but no luck, however, we managed to catch a boat coming off the lake and headed for the lock and at this point, the canal and lake are at the same level. This lock is part of the Okeechobee Waterway system which runs from Stuart thru the lake, 154 miles across the state to the Fort Myers area. 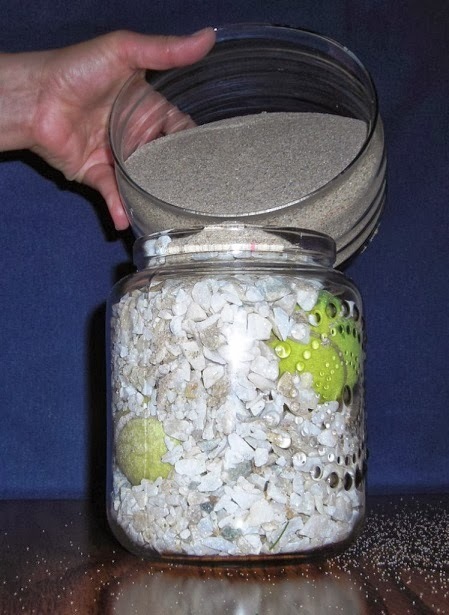 This allows boats and some barges to save the extra190 miles required to go around the keys. 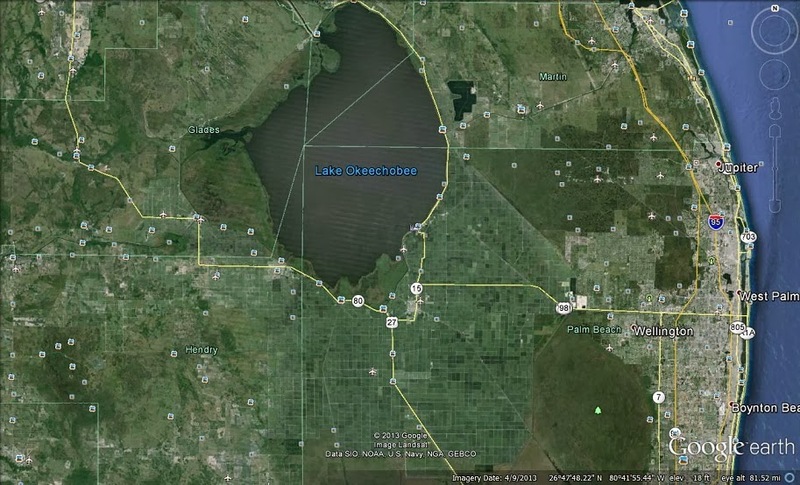 I have been amazed at the lake-surrounding rim and extensive canal system that provides for flood protection, transportation, and water to cities and the Everglades. I had no idea such a massive project had been undertaken. I know there is a tremendous amount of wealth in Florida and I suspect most of it resides within 10 miles of the coastline as it sure isn’t around here. Most of the area around the lake is pretty economically depressed and the further south we went the worse it became. I can only assume many folks are farm workers and it doesn’t pay well. While on the other side of the lake, we made a brief stop at the Brighton Seminole Reservation to make a small donation to the tribe. but most of them near us look more like these. Then there are some between these and ours, such as the KOA and the one in the last two shots. Most places seem to have started out as RV parks but they became permanent with the addition of a room alongside - there is a heavy concentration of these parks at the north end of the lake and most seem to have been around for quite a while. This is one of our favorite places as the Honey Bells are in and the grapefruits are delicious - hard to beat a Salty Dog made with good fresh grapefruit juice which Ferrell's squeezes. While this area certainly seems to be a fisherman’s paradise, there is not much here to offer the average camper unless it’s a warmer-weather-than-up-north-place to kick back, which is what we've been doing. We’ll be making day trips over to the Atlantic coast soon to check it out. During our first week in Florida, we hadn’t done any outside cooking, but when Pat arrived, we finally set up the kitchen – remember we’re more like campers than do-everything-inside-the-coach folks. When we left for Florida we tossed some things into the RV from the home freezer and one of them was a skirt steak (hard to come by in our area) with the idea of making fajitas. Then Mary at Barefeet In The Kitchen posted her recipe for reverse seared steak, and I thought I'd give the marinade a try with the fajita meat. Since I only had 1¼ lbs of meat I adjusted the garlic and kept everything else the same but the marjoram, which we didn’t have so it got omitted. Please pop over to Mary’s site for her recipe and a discussion on reverse seared steak (I’m with her and it is our preferred method for steaks and roasts). 1. Combine everything but the steak in a small dish. Rinse and pat dry the steaks and then rub them generously on all sides with the spice mixture. Place the coated steaks in a large ziploc or airtight container and let rest on the counter for 1 hour. (For the thin and flexible skirt steak, I just mixed the marinade in a gallon plastic bag, added the meat, and gave it a good massage. 2. Grill over a hot charcoal fire to your preferred level of doneness then cut across the grain into ½” wide strips. We had gone to a local farmers market a couple of days before and picked up several items so Bev made up a salsa of tomatoes, tomatillos, avocado, jalapeno, onion, grilled corn, canned black beans, lime juice, garlic, and S&P. She insisted on doing everything outside and pretended she was Paula Deen at South Beach – I’m sure Bev’s area wasn’t quite as fancy as Paula’s – she probably didn’t even have fishing rods laying on her table. The salsa was a delicious addition to the fajitas and there is no recipe to post as she invented it as she went along – so the next version will be a little different. We also had picked up some ripe bell peppers and onions which I pan fried in olive oil. My plan was to grill them but Paula had already cut them up in such a way as they would fall through the grates and we had no grill pan on board. Bev commented that she thought they were perfect (caramelized but not mushy) so it couldn’t have worked out better. So my fajita was a flour tortilla, meat, salsa, and veggies. Bev said these may have been our best fajitas ever (and she may be right) and a big part of it was the meat, so Mary here is another use for your recipe and thanks for helping with a delicious meal. I learned I wasn't a very good multi-tasker today when I typed in a Google search on my computer then put the cell phone up to my ear for the answer - duh. We awoke Tuesday to a 40* morning (balmy beside the zero at home) and the news that FSU won the BCS Championship - I was pulling for Auburn but only made it to the half before hitting the sack. We used most of the unusually cool day (high of 53) to stay inside and reorganize the coach – with a year’s experience, we have a better idea of where we want to put things. Our hometown friends, Ron and Nancy, who have been wintering in the area for six years, had several things that they wanted to make sure we did while down here and eat an "Okee" Burger was one of them. They called and suggested this was a good day to do it and after checking our busy schedule of RV organizing, we decided we could fit it in. Nancy had advised it was a favorite burger of hers and that it was huge, served on pita bread, and they usually split one. So we ordered one "Okee" Burger and an order of homemade onion straws. I remembered the photos this time - the burger is on a full sized dinner plate. The burger's uniqueness came from three things - it's size, the bread, and the secret okee sauce. Bev and I both thought the burger, served on the crispy, toasted pita was delicious and it stood up better than a bun - this may become the new norm at Almost Heaven South. And we thought the onion straws were even better – we ate that entire basket full. We knew we'd be going back to Uncle Larry’s, especially since they also serve breakfast and are located on our side of town. And speaking of breakfast, two days later we stopped in as Bev has seen chicken fried pork chop on the menu and wanted to try it. After I got done laughing at the size of her meal, I asked her what she was having when she finished that - couldn't believe it had two chops and all that food for $7.95. For $6.95, I had smoked sausage, two eggs, hash browns and biscuit. Both meals were very good and neither of us finished ours - we won't have to look very hard for other breakfast places but will likely try a couple more.